The Pokemon Center decided to update 2 hours late to keep everyone on their toes I guess. At any rate, here are this week’s announcements! The Pokemon Center On-Line store will be selling a life-size version of the Zeraora Pokemon Center plush. The website doesn’t have dimensions listed at the moment, but life-size means it should be about 4’11” (roughly the size of 1 Miki) and no idea on weight. Small child is shown in photo for reference; plush does not come with a free child. Zeraora will sell for 59,400 yen (including tax). Pre-orders will run from September 15th (Saturday) 10 am until October 28th (Sunday) 11:59 pm, with plush shipping out about mid February. Note that these plush will be made to order, so if you do not order during this time period, you cannot buy it after unless you buy from an unofficial reseller. The Pokemon Center didn’t forget about their regional can badge collection, and returns with the Unova region version, with can badges going on sale at all Pokemon Centers & Stores from September 22nd (Saturday). This set is split in two, with one set featuring people characters and Pokemon from Pokemon Black & White and one set featuring people characters and Pokemon from Pokemon Black 2 & White 2. These can badges are blind packaged, with each individual can badge costing 324 yen including tax. The Pokemon Center is trying to generate hype for Let’s Go Pikachu & Eevee (and succeeding). 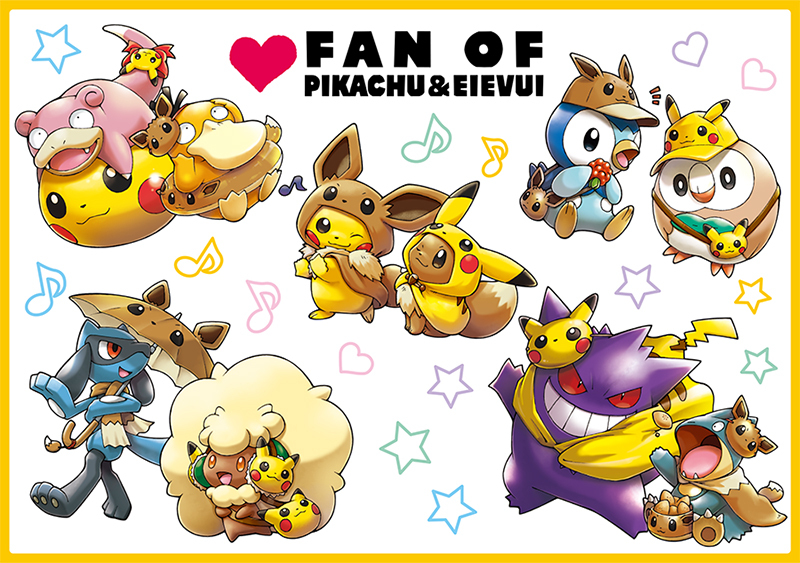 A brand new and super adorable Pokemon Center promotion, “Fan of Pikachu & Eevee”, will go on sale at all Pokemon Centers & Stores around Japan starting September 22nd (Saturday). 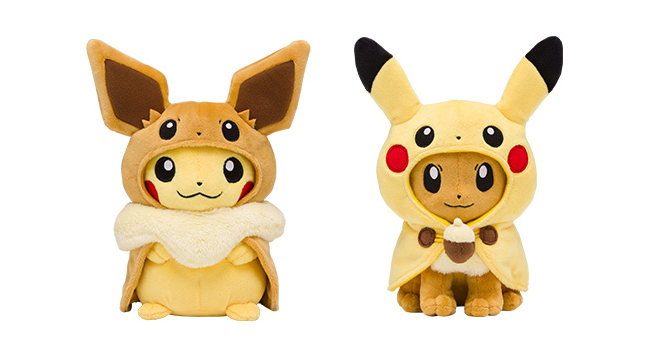 The promo primarily features Pikachu and Eevee, dressed as each other in ponchos, along with a couple other Pokemon fans. Last but not least! 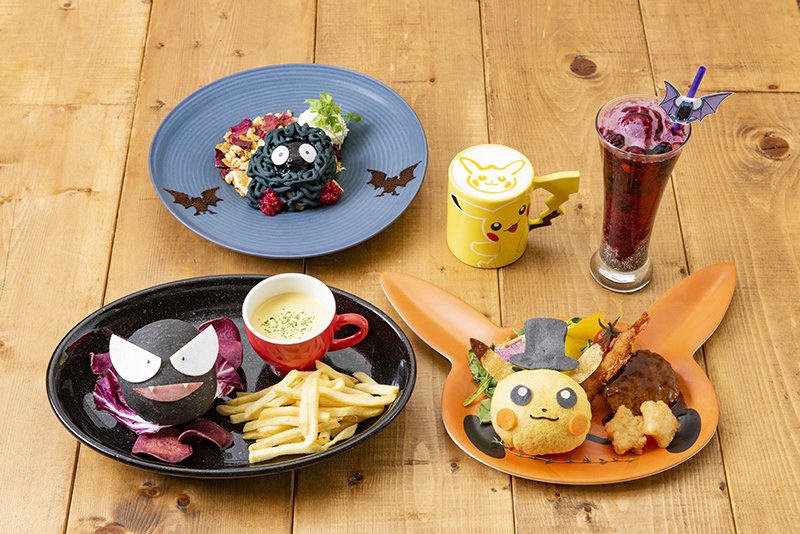 The official Pokemon Center cafe will be offering special Halloween menu items from September 8th until October 31st. If you’re in town during that time, don’t miss out! Along with the limited menu items, from October 1st until October 31st, the Pokemon Cafe will be using these Halloween themed lunch mats and giving out random Halloween themed coasters, one per drink order with 6 designs in total.